Even the younger crowd can enjoy the action on our toddler slide. 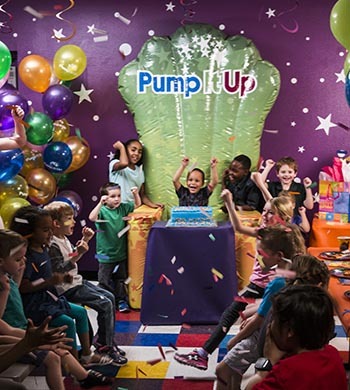 You will love our vibrant party rooms! Sit down and let us take care of everything for you and your guests! Enjoy your pizza and other goodies while you watch your party photos scroll accross the television and the Guest of Honor will receive the royal treatment. Kids physically become part of, and interact within, the game itself. The action zone with the X-Box Kinect Just Dance Game can accomodate up to 4 players. All future major league players line up here! Let your child test their hand/eye coordinations with this fun attraction! 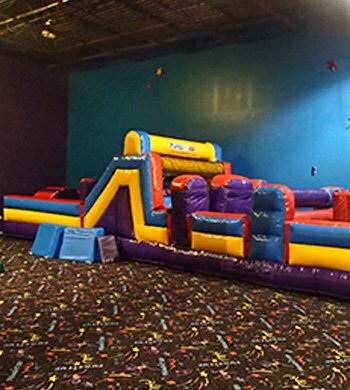 Race your friends through this AH-MAZE-ING obstacle course! Here is an inflatable that is totally unique. 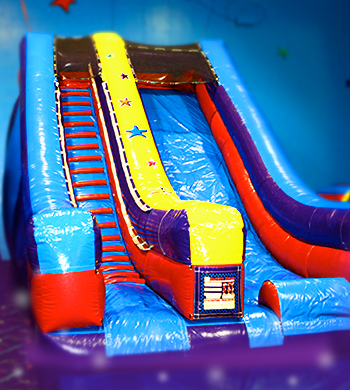 It has an obsticle course leading to an inflatable rock wall flanked by two slides. Grab a friend and have a race to the bottom. This is a blast for any age. How high can you go? 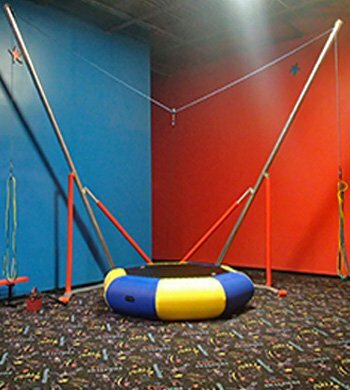 Have fun soaring in the air on this great attraction. 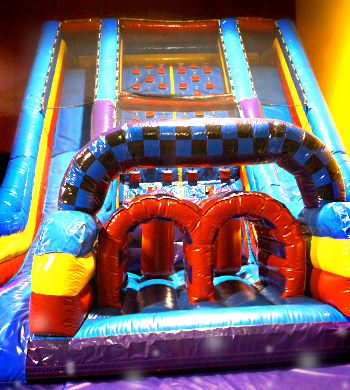 The Bungee Jump is included in every party package. 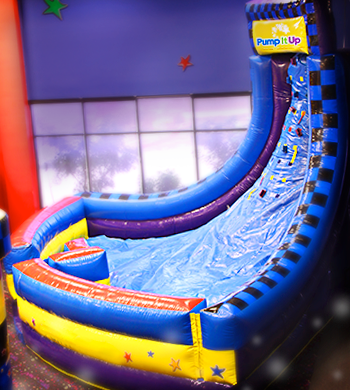 Don't worry, you don't have to attend a party to enjoy this attraction, you can purchase a ticket to jump during our Open Jumps. 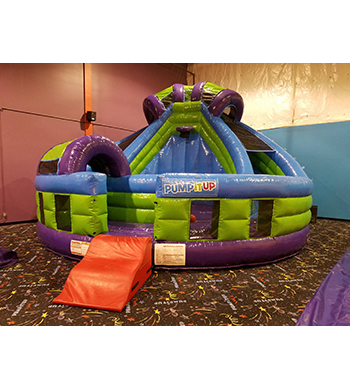 Enjoy our newest inflatable that includes a circular slide and a bounce area in the middle with a basketball hoop. 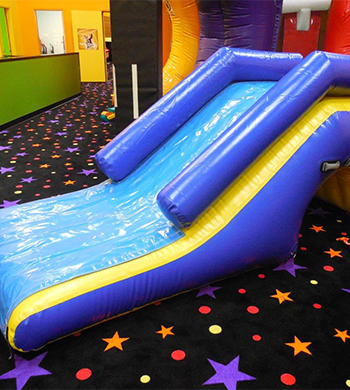 Everyone loves a slide! This is certainly a crowd pleaser! Even adults will love to climb up the ladder and slide down. 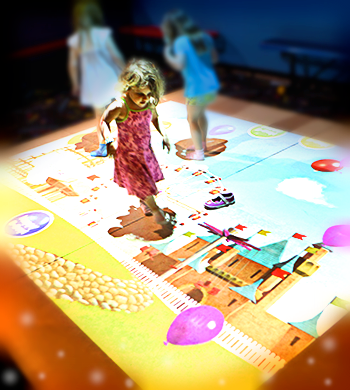 A game that takes a projection and turns the floor into augmented, interactive fun. 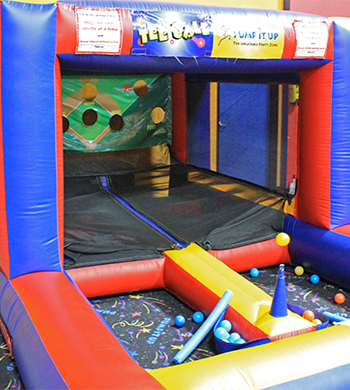 Motion Mania encourages kids’ playtime through imaginative play. 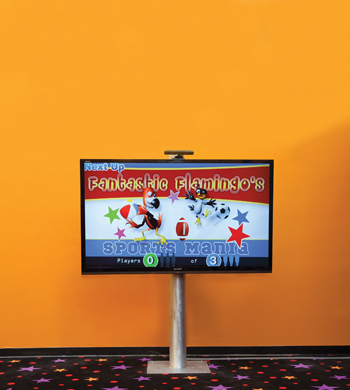 The customized playlist includes a wide variety of games including, Balloons, Super Soccer, Ball Pit, Piano and Disco Floor.